Oregon’s public employee retirements system (PERS) is now a staggering $20-$22 billion in unfunded liability. Just this week it was announced that it grew by another $3 billion and made front page news. A 2015 telephone poll of 300 Oregonians by the Taxpayer Association of Oregon Foundation showed that the public is clueless to this gigantic PERS debt hole which will consume state and local budgets for police, fire and schools. 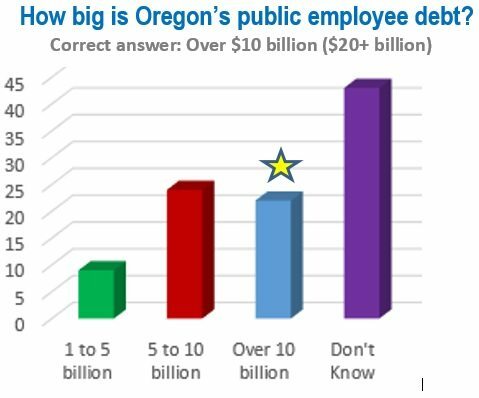 The Foundation asked Oregonians how big Oregon’s public employee unfunded liability is. Nearly half (43%) had no idea. Over a third 34% guessed below the actual amount (1-to-5 billion 9.3% or 5-to-10 billion 24.7%). Less than a quarter of Oregonians (22.7%) guessed correctly that the PERS debt was over $10 billion. When you put the numbers together you reach about 78% of Oregonians are unaware of the looming Public Employee pension (PERS) unfunded liability disaster. Yet, this mammoth unfunded PERS liability are a key reason that taxes and fees have been increasing over the years. This debt disaster impacts every avenue of Oregon’s government. This puts the 2016 Special Legislative Session in the spotlight. It is unknown what our elected leaders, Governor, Senate President and House Speaker, plan to do to address and fix the PERS debt disaster.